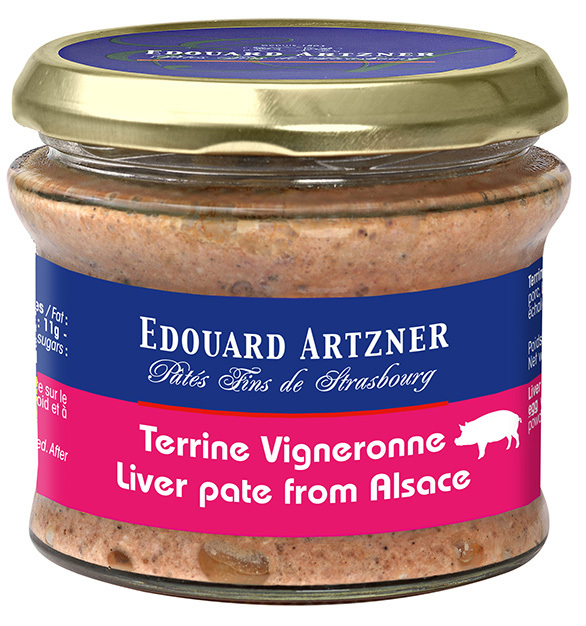 A tasty Edouard Artzner terrine which is typical of the region and is enhanced by the fruity flavor of Riesling, the famous Alsace white wine. Makes a delicious starter for two and works well in French food hampers. Storage: 2 years in a cool and dry place. Once open store in a fridge and consume within 3 days. Pork fat 37%, pork liver 27%, pork meat 14%, EGG white, water, potato starch, riesling (2%), salt, spices, onions, shallots, garlic powder. preservative : sodium nitrite. The “Vigneronne” terrine is delicious on canapé toasts or as part of a rustic lunch. Don’t hesitate to spread it generously on good brown bread. Simple pleasure guaranteed!